Ae Dil Hai Mushkil Teaser Released : The Teaser Trailer of Karan Johar’s Ae Dil Hai Mushkil has been released today by Karan Johar. Ae Dil Hai Mushkil Teaser Trailer stars Ranbir Kapoor, Anushka Sharma and Aishwarya Rai Bachan in the lead role. Ae Dil Hai Mushkil is slated for Diwali release along with Ajay Devgn’s Shivaay. Ae Dil Hai Mushkil is one of the most anticipated and awaited releases of this year. Watch Ae Dil Hai Mushkil Teaser Trailer here. Ae Dil Hai Mushkil marks the comeback of Karan Johar into Bollywood after superhit movie “Student of the year“. Fans are waiting for the movie also because of Aishwarya Rai Bachan’s presence in the movie. Aishwarya Rai was last seen in the movie Sarbjit in which her role was very well appreciated. 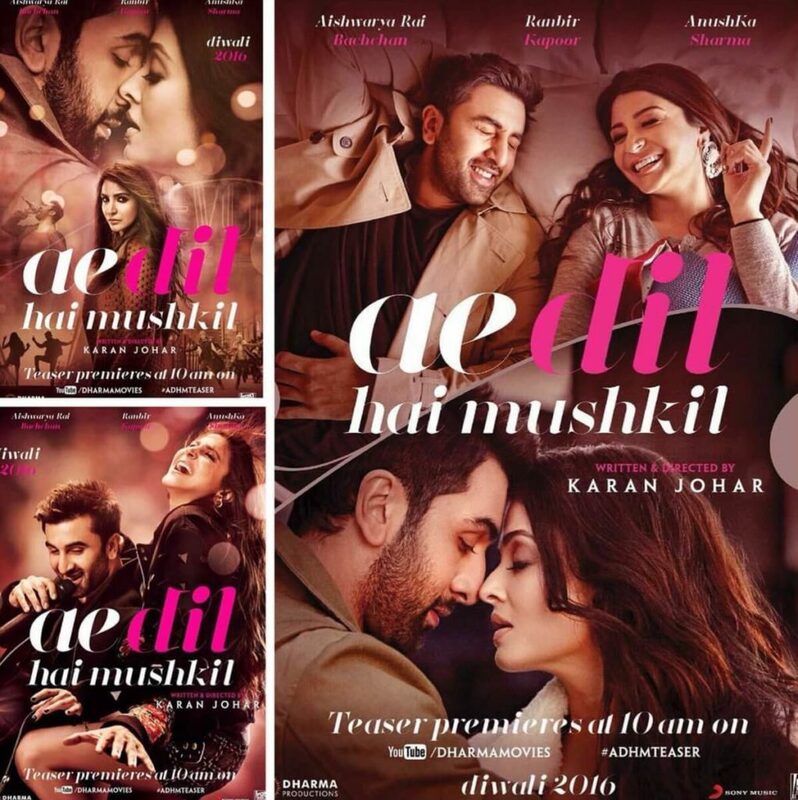 The first looks Ae Dil Hai Mushkil has already created buzz for the movie. The first look shows Ranbir Kapoor with Anushka Sharma and Aishwarya Rai Bachan in two different parts. In one part, It shows Ranbir and Anushka Sharma laughing on the bed, while the other shows the Aishwarya Rai and Ranbir Kapoor in a very romantic pose. Ranbir Kapoor is coming back to the silver screen after his last year Hit, Tamasha. After seeing the first look, we can say that the movie will be of love and romance, for which Karan Johar is known for. Ranbir, Anushka, and Aishwarya are looking gorgeous in the first look and we just can’t wait for the teaser. The teaser of the movie was unveiled at 10 AM today. Ae Dil Hai Mushkil cast consists of Ranbir Kapoor, Aishwarya Rai, Anushka Sharma and Fawad Khan. Shah Rukh Khan has played an important cameo in the movie. The movie is directed by Karan Johar and produced by Dharma production and Fox Stars, the movie is slated for release on 28 Oct 2016. Ajay Devgn’s Shivaay is also slated to release on the same day. Rustom Box Office Collection: 18 days record will beat his "Airlift"